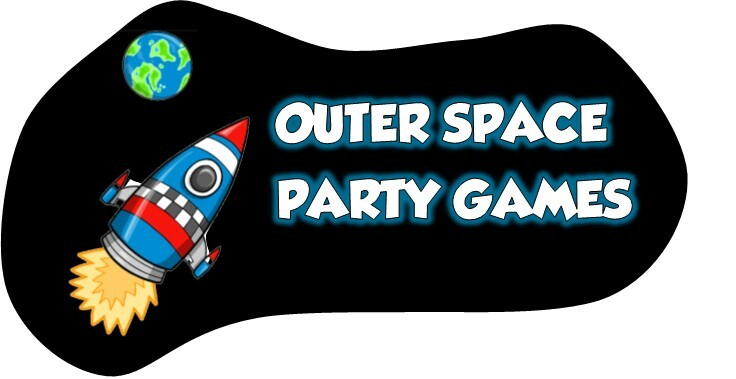 Outer Space Games for Birthday Parties! Make your outer space games out of this world FUN! Take a look at these outer space birthday party ideas to find the perfect space party games and activities for you. 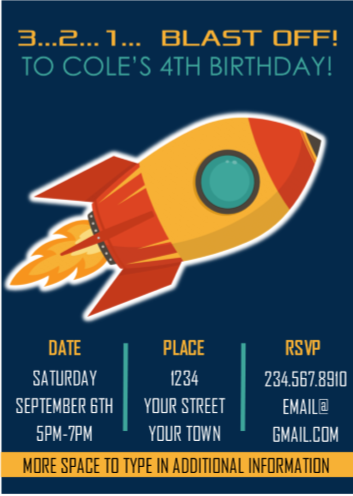 Need Outer Space Party Invitations? 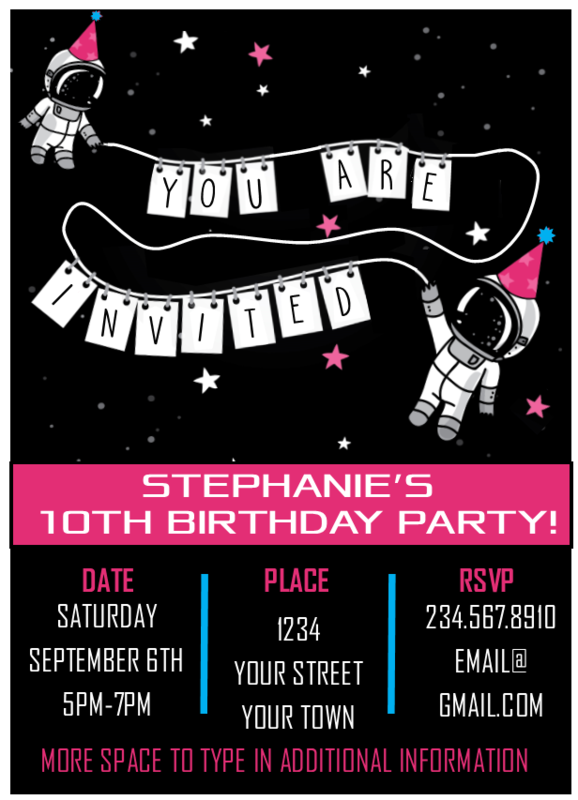 Check out my printable space party invitations, they are easily editable. 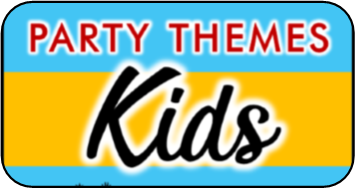 Personalize in seconds, print and your ready to party! In this outer space theme party game the little space explorers must keep all the asteroids (balloons) up in the air while the music is playing. When the music stops they all grab an asteroid and you call out a color. Whoever has that colored asteroid must pop it and complete the challenge inside to win a prize. 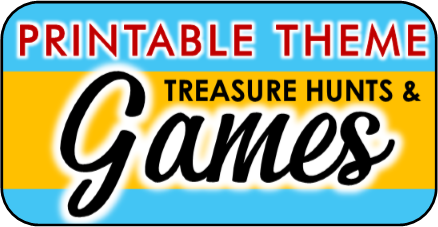 The game continues until all Explorers have received a prize. You’ll need balloons of all different colors, and challenges to put inside them before you blow them up. This game feature 8 Alien themed clues that players must work together to solve. Each clue leads to the next in an exciting quest to the treasure! This hunt can be played anywhere because it is designed so that the host can decide the hiding locations. 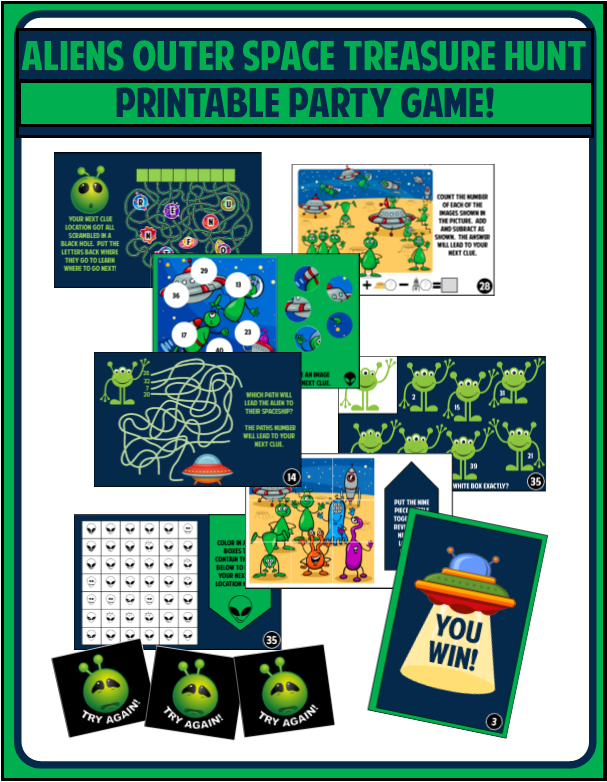 This game is perfect for an Alien or Outer Space themed party for kids ages 5-12. See details of the game and full clue samples. In this outer space theme relay race the explorers divide into two teams and race, wearing our fun moon walkers, around the flag and back. They then pass them to their teammate to put on and run the race. The teams whose explorers finish the race first wins! You can make “moon walkers” by taking a large coffee can and poking two holes in it- one on each side, directly under the bottom of the can. String twine (or other tough string) through the holes and tie the ends together to create a rope handle. The rope handle should be long enough for the child to stand on the can and grab the handle without hunching. You’ll need four. This is a perfect game for your space theme party. I think it makes a fun twist on the ol’ pinata. You or another fun-spirited adult puts on a Green Alien mask and the explorers must try and catch it with their space wranglers (hula hoops). When the alien is lassoed he throws out a handful of theme candy for his release. We like to think of this game as a pinata, but a lot more fun! This game continues until all the candy is gone. You can usually find hula hoops at the local dollar store. As an alternative to hula hoops you can create laser sticks out of rolled up aluminum foil and simply have the kids tag the alien with them. You’ll also need a fun alien mask (make yourself or check out the one below) and a bag of candy. In this outer space party theme game the explorers must collect all the planets in our solar system( plus Pluto) and rush them back to their teams star keepers. They then must put them in the correct order to win the game. This game can be played as two teams or one big team for a non competitive version. You can make the planets, or simply print them out on card stock. Hide two sets of planets around the playing area. Teams are only allowed to pick up one of each planet. Provide a poster board for each team to tape their planets on. The little explorers have a blast trying to ring Saturn. Set up a beach ball as the planet Saturn and challenge the kids to toss a hula hoop and try and ring Saturn. Let them try from different distances to add to this theme challenge. The outer space explorers will have a blast making their way through an outer space obstacle course. Obstacles can be created from anything, all you need is a little imagination. You can even include some fun mini-games as an obstacle. In this theme game the outer space explorers must try to collect as many Martian rocks as they can and race them back to their ship, but they must beware of the Martian. The Martian is guarding the Martian rocks and if he tags an explorer they must drop any Martian rocks they have and run back to their space shuttles. When all the rocks have been collected the explorers can open them up and share the prizes inside. You’ll need an adult Martian volunteer, a bag of candy, and Martian rocks. Martian rocks can be made by wrapping a piece of candy or small prize in aluminum foil. To play have the Martian stand in the middle of the playing area surrounded by the Martian rocks. The little explorers wait on either side until the word GO. Their shuttle can be a basket or bucket to collect their rocks in. Hang a hula hoop from the ceiling and provide all the guests with paper to make their own paper shuttles or airplanes. They then practice flying their shuttles by trying to fly them through the hoop. They can start close and get farther and farther away. 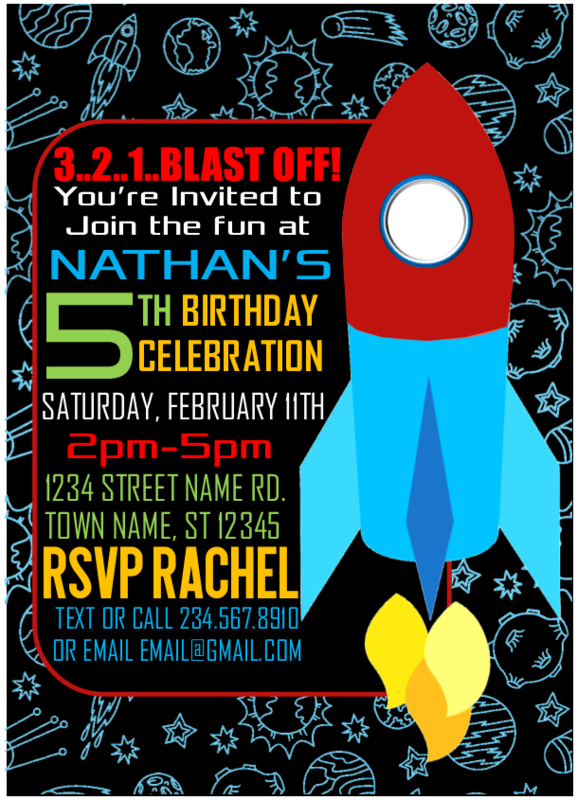 Our printable invitations can be your within minutes. Each of these invitations allows you to easily edit the details to fit your party. Simply open in adobe reader, click on generic text and delete, and then type in your own. Fonts and style already built it - all you do is type and print! Each invitation comes 2 per page and measures 5x7. Print as many as you need for your occasion for the one pay price of $5.99.